"Massachusetts Births and Christenings, 1639-1915," database, FamilySearch (https://familysearch.org/ark:/61903/1:1:VQXX-YJK : 4 December 2014), Melinda E. Leathe, 11 Jan 1831; citing CAMBRIDGE,MIDDLESEX,MASSACHUSETTS, ; FHL microfilm 496,864. "Massachusetts Deaths, 1841-1915," database with images, FamilySearch (https://familysearch.org/ark:/61903/1:1:NWWB-87G : 10 December 2014), Melinda E. Leathe, 05 Aug 1898; citing Cambridge, Massachusetts, v 482 p 147, State Archives, Boston; FHL microfilm 961,525. "Massachusetts Marriages, 1841-1915," database with images, FamilySearch (https://familysearch.org/ark:/61903/1:1:N43S-3RS : 17 February 2016), William Blair and Sarah Leathe, 17 Jun 1871; citing , Wakefield, Massachusetts, United States, State Archives, Boston; FHL microfilm 1,433,029. "Massachusetts Births, 1841-1915", database with images, FamilySearch (https://familysearch.org/ark:/61903/1:1:FXZR-BW5 : 1 March 2016), Fannie Blair, 1871. "Massachusetts Births, 1841-1915", database with images, FamilySearch (https://familysearch.org/ark:/61903/1:1:FX8S-K2G : 1 March 2016), William F. Blair, 1874. "Massachusetts Marriages, 1841-1915," database with images, FamilySearch (https://familysearch.org/ark:/61903/1:1:N4HS-JXW : 17 February 2016), Lawrence Robinson Blair and Gertrude Elizabeth Adams, 20 Dec 1905; citing , Milford, Massachusetts, United States, State Archives, Boston; FHL microfilm 2,057,623. Thomas W. Baldwin, Vital Records of Cambridge, Massachusetts, to the year 1850, Boston: Wright & Potter Print. Co., (1914) , Vol. 2, p. 238. "Massachusetts Death Index, 1970-2003," database, FamilySearch (https://familysearch.org/ark:/61903/1:1:VZ5Z-983 : 4 December 2014), Muriel J Drummond, 14 Jun 1970; from "Massachusetts Death Index, 1970-2003," database, Ancestry (http://www.ancestry.com : 2005); citing Sudbury, Massachusetts, death certificate number 025240, Commonwealth of Massachusetts Department of Health Services, Boston. "Massachusetts Deaths, 1841-1915," database with images, FamilySearch (https://familysearch.org/ark:/61903/1:1:N7PY-F42 : accessed 2 December 2015), Isabella Leathe, 09 Aug 1875; citing Cambridge, Massachusetts, v 275 p 81, State Archives, Boston; FHL microfilm 960,207. "United States Census, 1850," database with images, FamilySearch (https://familysearch.org/ark:/61903/1:1:MDS3-Y2R : 9 November 2014), John Leathe, Lowell, ward 5, Middlesex, Massachusetts, United States; citing family 1078, NARA microfilm publication M432 (Washington, D.C.: National Archives and Records Administration, n.d.). George Freeman Sanborn Jr., Vital records of Hampton, New Hampshire : to the end of the year 1900, Boston, Mass. : New England Historic Genealogical Society, (1992) , Vol. 2, p. 87. George Freeman Sanborn Jr., Vital records of Hampton, New Hampshire : to the end of the year 1900, Boston, Mass. : New England Historic Genealogical Society, (1992) , Vol. 2, p. 64. William Plumb Bacon, Ancestry of Daniel James Seely, St. George, N. B., 1826, and of Charlotte Louisa Vail, Sussex, N. B., 1837- St. John, N. B., 1912; with a list of their descendants, , at https://archive.org/details/ancestryofdaniel00baco . New York: Press of Tobias A. Wright, (1914) , p. 29. Ezra S. Stearns and William F. Witcher and Edward E. Parker, Genealogical and family history of the state of New Hampshire, New York and Chicago: Lewis Publishing Company, (1908) , Vol. 4, p. 1681. George Freeman Sanborn Jr., Vital records of Hampton, New Hampshire : to the end of the year 1900, Boston, Mass. : New England Historic Genealogical Society, (1992) , p. 187. 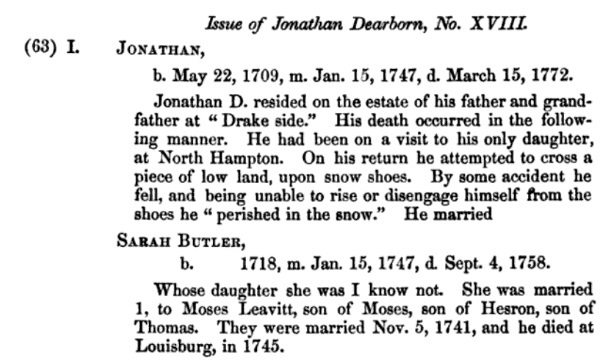 "New Hampshire Birth Records, Early to 1900," database with images, FamilySearch (https://familysearch.org/ark:/61903/1:1:FLPB-S56 : accessed 6 December 2015), John Neal, 19 Jul 1768; citing Merrimack, Hillsborough, New Hampshire, United States, Bureau of Vital Records and Health Statistics, Concord; FHL microfilm 1,001,024.
reference number: v B p 67.
reference number: v B p 111. Joseph Dow, History of the town of Hampton, New Hampshire: From its settlement in 1638, to the autumn of 1892, Vol. 2, , at https://archive.org/details/historyoftownofh02dowj . Salem, Mass. : Printed by the Salem Press Publishing and Printing Co., (1894) , p. 817. George Freeman Sanborn Jr., Vital records of Hampton, New Hampshire : to the end of the year 1900, Boston, Mass. : New England Historic Genealogical Society, (1992) , Vol. 2, p. 22. George Freeman Sanborn Jr., Vital records of Hampton, New Hampshire : to the end of the year 1900, Boston, Mass. : New England Historic Genealogical Society, (1992) , p. 135.